Fraank Tyson - was he the best second innings bowler ever? When Martin posted his feature on Frank Tyson, it reminded me of his astonishing second-innings figures (Tyson’s, not Martin’s) – Tyson posted an incredible second-innings average of 9.58, as compared to his first-innings average of 29.08. I decided to take a look and see how unique he was in terms of raising his game for the second innings. Statham and Bedser’s figures are more along the lines of what we would expect, i.e. pretty similar figures in both innings taking into account the fewer second innings bowled, with a slight improvement in the second due to gradually deteriorating wickets in the days of uncovered pitches. In the context of his peers Tyson’s second innings figures are truly amazing. But I want to see just how amazing these figures are in context, which means lookng at everyone else’s performances and allowing for changes in performance by era. To determine the best second-innings performers I want to look at the main issues of averages, strike rate and wickets. I’m not convinced that Economy Rate tells us as much when taking into account timeless Tests and covered pitches since the early 1980s. 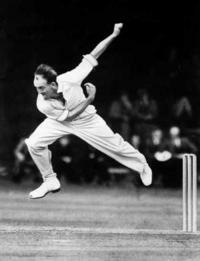 Most of the above (other than Tyson and Ironmonger) played in the 19th century – the next lowest post-WWII bowler after Tyson is Ernie Toshack, who played twelve Tests just after the war, culminating with the Invincibles tour of England in 1948 and enjoying a career Test second-innings average of 16.46. So Tyson really was quite special in terms of second innings performance alone. But, I hear you cry, the fifties was a relatively low-scoring era too! Which is true, and we’ll bring that into the equation later. So Tyson is indeed miles ahead of the next best, Andy Blignaut and Jack White, but this list doesn’t really feature what we would consider top bowlers – there are many who have a poor first-innings average which leads to a favourable ratio, e.g. Jack White’s first-innings average is almost 50. Interesting to see both Barnes and Lohmann in there, though their averages for both innings are still low. Of course bowling averages in general were lower pre-WW1, however as we’re dealing with a ratio here that isn’t too much of an issue – the era-adjusted list is very similar to the unadjusted. Tyson is bested here by Jack White, but as mentioned above White’s performances as a comparison of second- to first-innings are a little misleading – Tyson is significantly ahead of Nupen and if we restrict the listing to players who, like Tyson have an average of less than 20 the next best is Spofforth with a ratio of 1.646. Most of these will be well-known to most of you, though the appearance of “Ranji” Hordern in this list might surprise a few . Hordern would have surely played in more than a handful of Tests however, running a dental practise he chose not to travel to England for the 1912 Triangular Tournament and after the war had already retired from First-Class cricket – as can be seen above for the short time he played he was right up there with the best of them. Again these basic ratios are a bit misleading in terms of identifying higher pressure performance, as O’Keeffe for example only took 29 first innings wickets. One thing which impacts this somewhat is how much bowling was totalled in each innings – prior to WW1 opening bowlers accounted for between 55-60% of the overs bowled, whereas from the 30s-70s the figure was less than 40%. Finally, to offset the impact of bowlers who perform poorly in the first innings and adequately in the second while still having a high ratio, I also want to add here the concept of “extra wickets”. Extra wickets is the number of wickets taken above that which would be expected based on the number of balls bowled by the player as calculated from the average strike rate. The totals of Ferris and Lohmann have been reduced significantly but even taking that into consideration they still lead the pack. Steyn only recently overtook Tyson to move into fourth place all-time. In summary, it can be seen that Tyson rates as top performer in terms of all of the major aspects of average, strike rate and wickets when comparing second- and first-innings performances. Not sure how Martin rates.